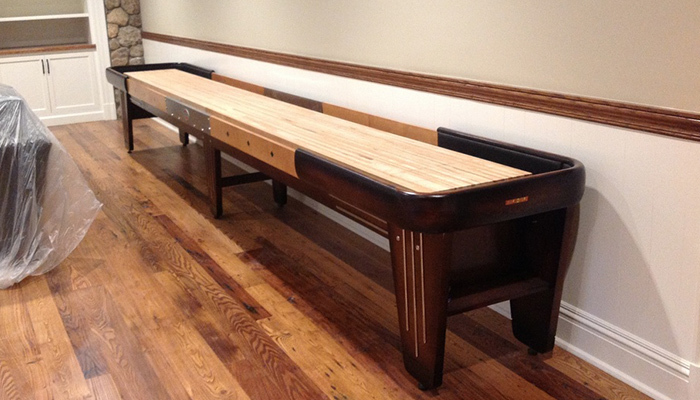 Each shuffleboard table is proudly made in America and crafted by hand at our Grand Rapids, Michigan factory using locally derived resources. 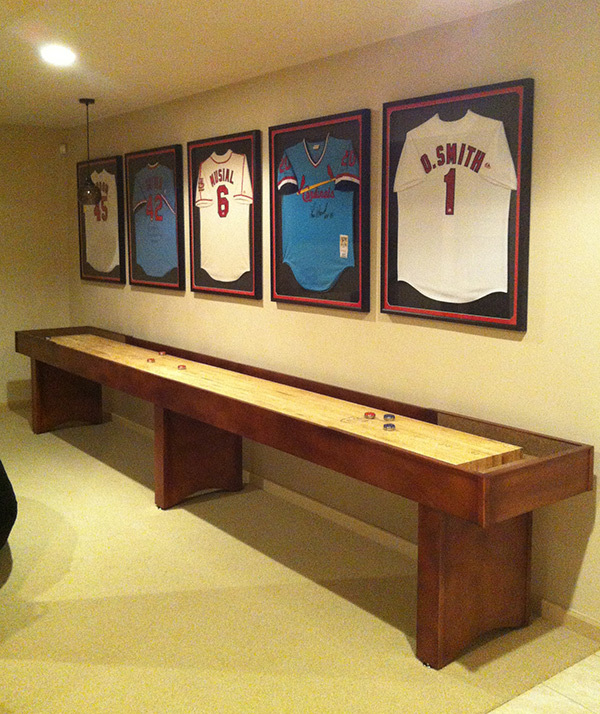 Each shuffleboard table is custom made to order and will meet your game room décor and size needs. 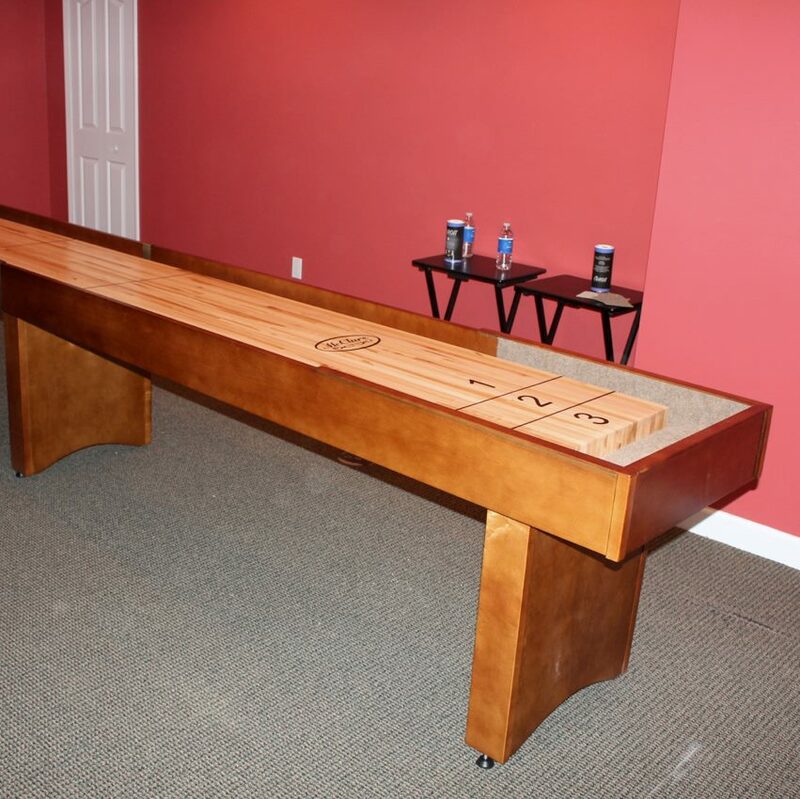 In addition, we have a select number of completed shuffleboard tables for fast delivery and a sizable stock of hand crafted, pre finished parts for efficient assembly. Review: When I first spoke with Todd, he answered all my questions and offered to deliver and install a 22' Rock-Ola to my home over 800 miles away from his operation. That sealed the deal for me! 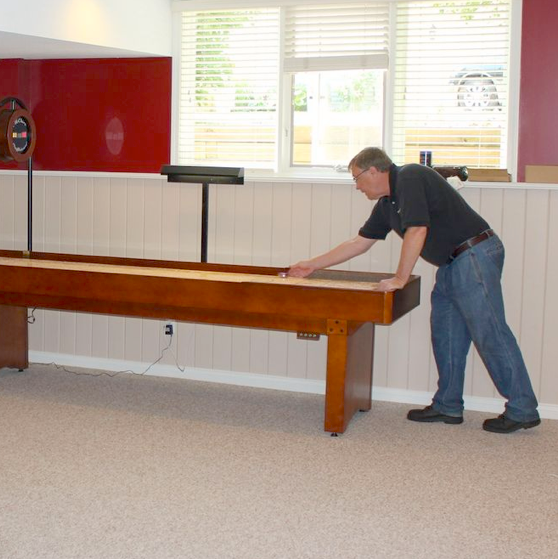 On our scheduled delivery day, the table was quickly assembled, leveled and we were ready to play! 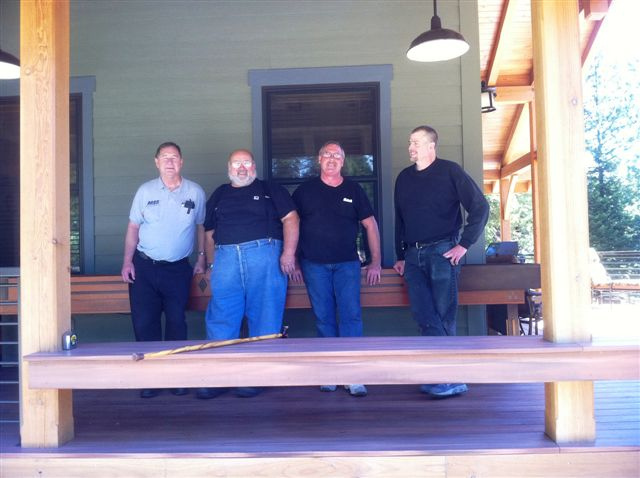 Todd and his team at McClure Tables exceeded my expectations for the quality of his workmanship and service. 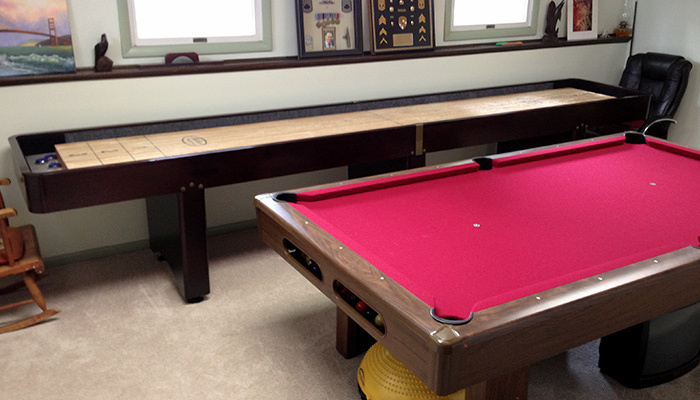 Review: I have a Rock-Ola 18' table and my experience with Todd McClure and team was fantastic. The craftsmanship of the McClure team is top notch and it is refreshing in this day and age to deal with real people that get the job done. Our table was damaged during delivery and Todd had the table shipped back to Michigan, repaired the damage and shipped back to our home in CT just as he said he would. 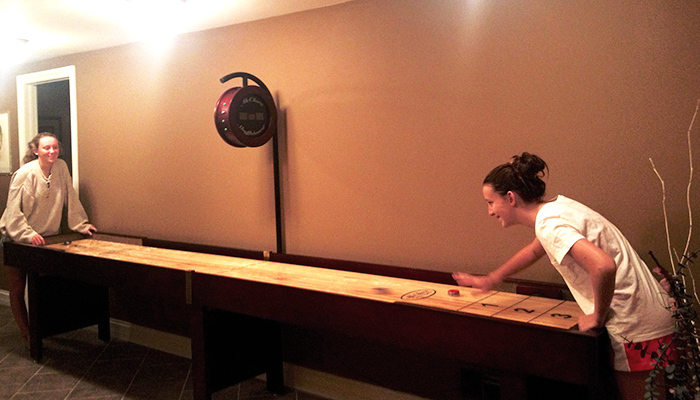 Our Rock-Ola now provides fun for our entire family and looks terrific in our new basement. 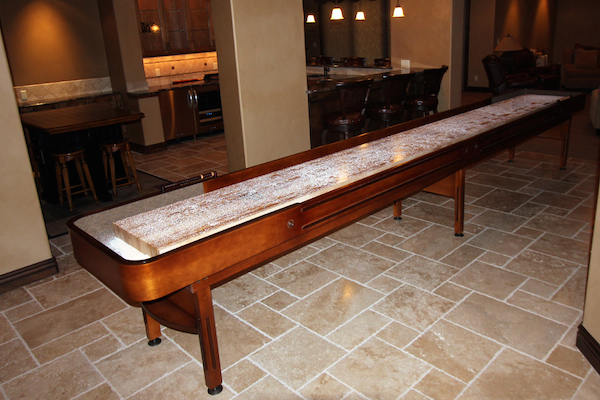 Review: Our guests at theLeGrand Headwaters Ranch in central west Texas have certainly enjoyed the hand crafted McClure shuffleboard table. We are host to hunters for white tail deer, get-togethers and corporate functions. 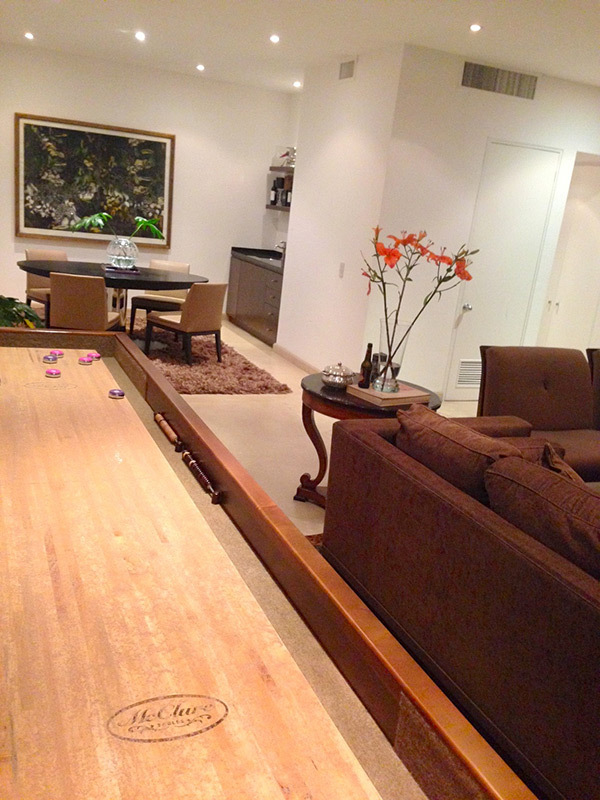 All of these guests love to play on this McClure table. They have played tournaments as well as having spirited friendly competitions. One such competition ended with a Black Buck Antelope hunt being awarded to the winner! Now that was serious competition. This beautiful table personalized with our logo, adds another element of entertainment for our guests. Not only was the service from McClure Tables outstanding, the delivery was simple and easy. We at LeGrand Headwaters Ranch want to thank you for helping us design just the right custom table for our beautiful rustic Headwaters Lodge. We invite you to come see for yourselves how beautifully it fits with our needs. Thank you, Jean Ann & Robert LeGrand, LeGrand Headwaters Ranch Eldorado, Texas. Review: McClure Tables is a customer oriented company with quality products. When I initially called 4 years ago to discuss table options I talked to the owner of the company. I didn't ask for him, he just happened to be the one that answered the call. 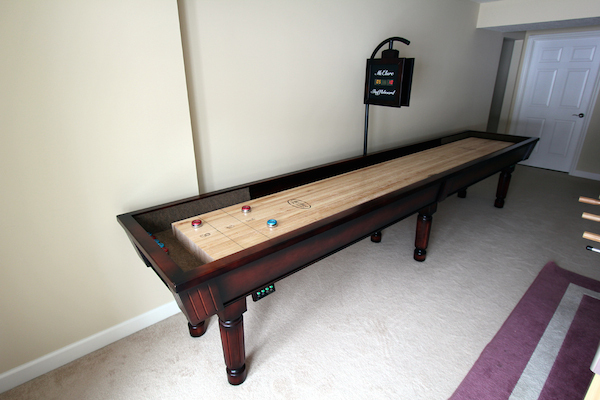 We discussed in detail the construction and workmanship of the tables and I liked what I heard.Shuffleboard tables aren't cheap and these weren't the cheapest around, but I took a leap of faith and ordered one. I could not have been happier with my selection, the table was better than I expected. It has held up superbly over the years only requiring a few tweaks of the built in climate adjusters. I would highly recommend a McClure table for anyone looking for more than just a game table. This truly is a finely crafted piece of furniture that we can play on every day. 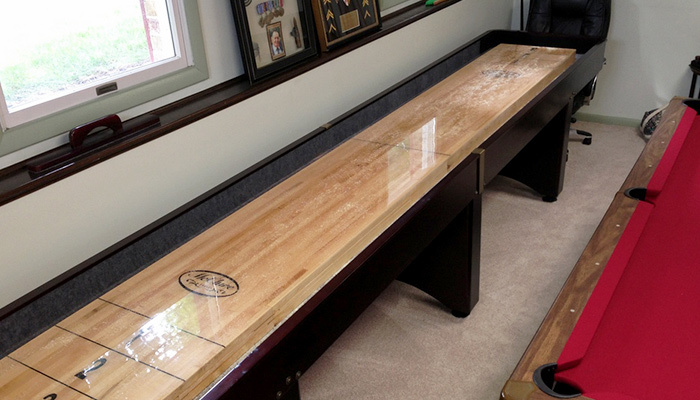 Review: Todd, I wanted to thank you so much for all the effort you and your team put into my new shuffleboard purchased from Von's in Rockford. I am the lucky recipient of the custom two piece 12ft board (the 3rd time is a charm) that is now being used to its fullest extent in my new basement. You guys did a great job and pulled through to get me taken care of-everyone I know will know where to look for a shuffleboard!! Review: We love the table. I rolls very true and is a very attractive piece of furniture. The only issue we had was that when we put it together it appeared that a few of the holes that attached the legs to the frame were not drilled properly, based both on the lack of structural support that was present where the holes were placed and on the pictures in the directions. However, the folks that I had helping easily modified them and it came together pretty easily. My guess is that the rush that you were working under to deliver prior to Christmas might have led to this and it was well worth it to have for the holidays. Again, thank you for having it completed as quickly as you did and we expect years of pleasure from the table. Review: Todd and mark Here's the crew you hired for me Mike is second from the left I was a little apprehensive at first because they had to get down a fairly steep slope to the deck. But they put my worries to rest as soon as I opened the trailer and they set to work. They were great. Very efficient and entertaining They couldn't have been nicer. It looks great. Can't wait to play Thanks for everything. 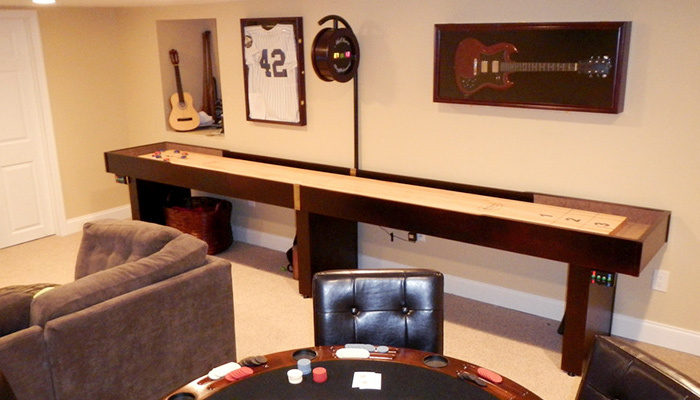 Review: The staff at McClure Tables were very helpful in helping me pick out the perfect table for my game room. The board is of exceptional quality. Not only have we had a great time using the table, [but] it is a beautiful, show-off piece of furniture. I highly recommend them. Review: I was a local buyer and Todd McClure was great. He was always quick to respond to all the questions I had when trying to find the right table. He even had me out to the factory to look at different tables. He helped me pick the perfect table for me taking into account size, style and budget. I paid to have them deliver and set yo the table and they were great. 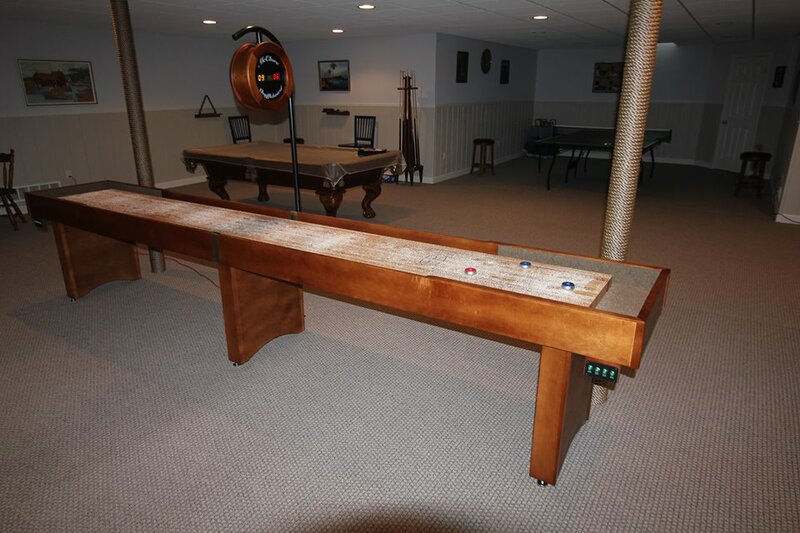 I had my basement finished and remodeled with the shuffleboard as the centerpiece. The compliments I receive about the room and table are endless. I can't think of anything they could have done better. I wouldn't consider using anyone else. 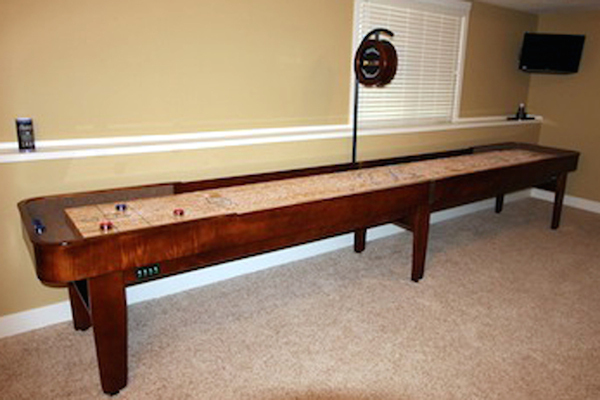 Review: I have been wanting a Tournament Shuffle Board Table for a long time and finally decided on a 22 foot table since room was not a factor. The internet was used to research and study all the available information. The Table I finally decided on was a McClure Table since it seem to fit all of the requirements needed. The decision was made, but I wanted to talk to a real person before the order was placed and that much money was issued to a complete stranger. A phone call was made to McClure Tables and Todd McClure answered the phone call. The response was very positive on both ends of the conversation, the order was made and the table was on the way. Three weeks later the table arrived, with no damage, everything seemed perfect, table was assembled, leveled, and ready for play. The following days something was very wrong with the table, the weights would not stay and as days went by the ends begin to crack and become wavy, the board became unplayable. The first thing that comes to one's mind, is this money lost, and a deal gone bad. The next day an e-mail was sent to Todd McClure explaining the problem with the table, and before the end of the same day Todd had a positive response. Todd said get pictures and measurements e-mail them and I will research the problem and get the problem fixed. TODD McCLURE FIXED THE PROBLEM, a brand new PLANK arrived at his expense with out any hassle what so ever. I have nothing but good things to say about the product and the man who owns the company,TODD McCLURE, an honest and trustworthy person. 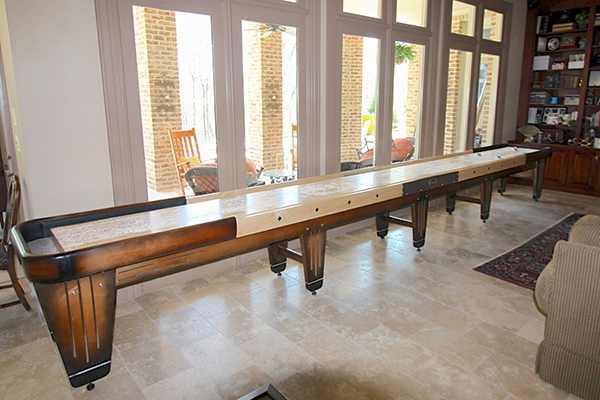 Review: We love our McClure shuffleboard table! It is beautifully made and everyone who sees it admires it. And we have so much fun with this table! Our adult children love it,as do our grandkids. The youngest ones who aren't quite old enough to play love to help us keep score - we love our electronic wood score unit as well. It's a great look. Our experience with McClure was wonderful. Todd helped me with the decision as to which table was right for us, as well as the choice of stain color. He made the ordering process easy, and could not have been nicer. The table arrived on time, and the crew who McClure arranged to set it up did a great job. Everything we needed to start playing was included - the wax and pucks. I wouldn't hesitate to recommend this company. Thank you, we are so pleased!! 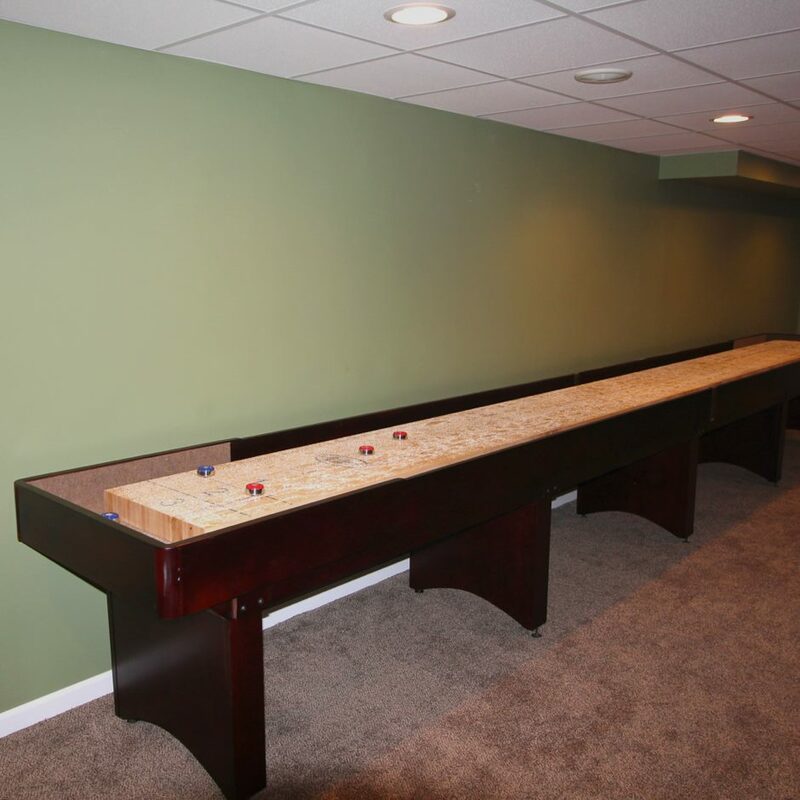 Review: My wife and I were in the process of renovating our basement and thought that a shuffleboard table would be a great addition to the room and something that everyone could enjoy. While search both online and locally in a few stores, we weren't quite sod on the quality and service that other stores were offering. After searching more online, I came across McClure Tables and found out they were local to Grand Rapids, which is where we live. I called Toff, the owner, and he said to come down to his shop and we could have a look at their product. My wife and I then drove over to his facility and was greeted with a warm welcome. Todd showed us around the factory himself and also helped us out with designing/ordering our shuffleboard. We were very happy with the level of customer service he provided and also his knowledge and craftsmanship in this industry. A few weeks later the table was ready to be delivered and Todd personally delivered it and set it up. 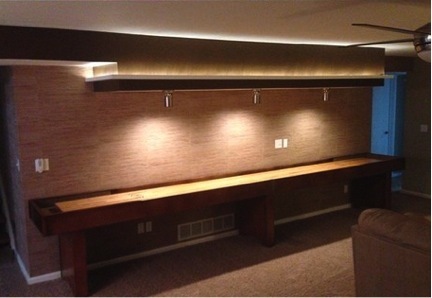 Again, the quality of the table was incredible and we couldn't be happier with his customer service. 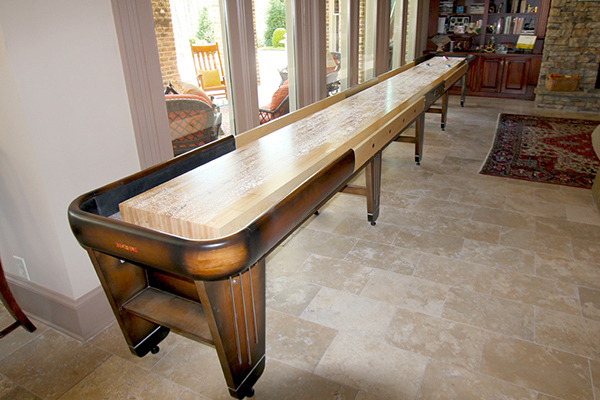 I will definitely recommend Todd and McClure Tables to anyone that is in the market for a shuffleboard. Thanks again Todd! Review: After a great deal of research I recently purchased a 16 ft Tournament II table. Shipping and delivery was simple and the assembly of the table was surprisingly easy. The table looks like a piece of high end furniture and the playing surface is fantastic. The service was great, obviously Todd McClure and his staff take great pride in their product. I would highly recommend the McClure table. 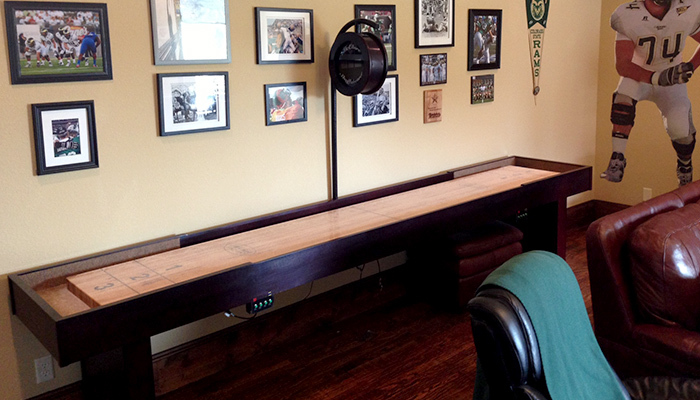 Review: I am very please with my McClure shuffleboard table, as well as the McClure company in general. I would easily recommend them to a friend. The table quality is is very good, the set up was very easy and quick. It was packaged well, so there was no shipping damage. Delivery time was well beyond my expectations. I ordered 1 week before Christmas and expected a delay, there was none. If fact it arrived before Christmas and I was able to enjoy the table with my family over the holiday. As a new customer, I'm impressed with every aspect of McClure. Review: Just wanted to let you know how much we love the table. The quality is even better than we had hoped for, and we had high hopes. Not only are you and your employees craftsmen, but the guys who delivered and set the table up couldn't have been more careful. From start to finish, everyone at McClure did a great job. Thank you! Review: My McClure Tournament Shuffleboard Table in traditional mahogany has been in continual use for over 5 years and shows no signs of wear. We entertain quite a bit, and all my guests are always in awe of the furniture quality, ultra high-gloss finish of the playing surface, and effortless way the pucks seem to float towards the scoring zone. The Adroit table wax Crystals you sell is a perfect complement, and a light dusting before play keeps the table in perfect condition for that magical feeling this table provides to everyone. Photos alone are not enough to capture the feeling of pride in owning a McClure table. You have to play it to believe it. Review: As the Founder of the fastest growing sports bar & grill, we initially purchased Champion tables, but after contacting Todd McClure we have now switched to McClure Tables. The personal service, high quality, and price fit well within our business model. Like McClure Tables, Bikinis Sports Bar & Grill is a very fast growing company with a commitment to higher quality & better service than the competition. 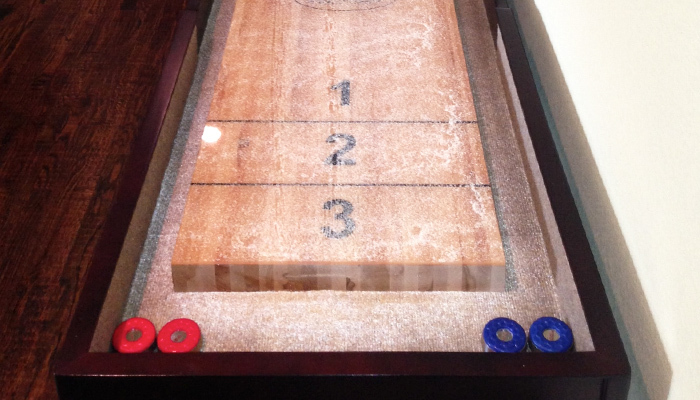 Review: To Todd, It has been a year since I received my shuffleboard. You created a lot of fun with my family and friends. It is truly a wonderful asset and I can not thank you enough. By the way, after sixty years, I haven't lost my winning ways. NYC bar's training. 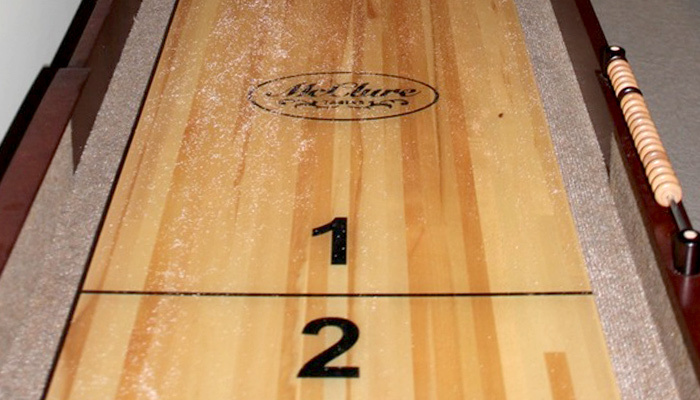 Review: After doing a considerable amount of research, I decided to purchase a McClure Tournament II shuffleboard table. First of all, I am very impressed by the quality of the product - it is first rate, no doubt. But I didn't expect anything less - that's why I chose this table. What I didn't expect was the outstanding customer service provided by Todd and his team. From start to finish, whether it was choosing the correct model, size and stain color, dealing with my unique height and scoreboard requirements, or coordinating efficient shipping and installation... Todd worked with me to help me get me exactly what I wanted, how I wanted it - quickly (they were even ready to deliver the table before I was) and at a good price. Like I said, the table is beautiful - exactly what I wanted and then some, but the service was impeccable. Thanks again Todd. 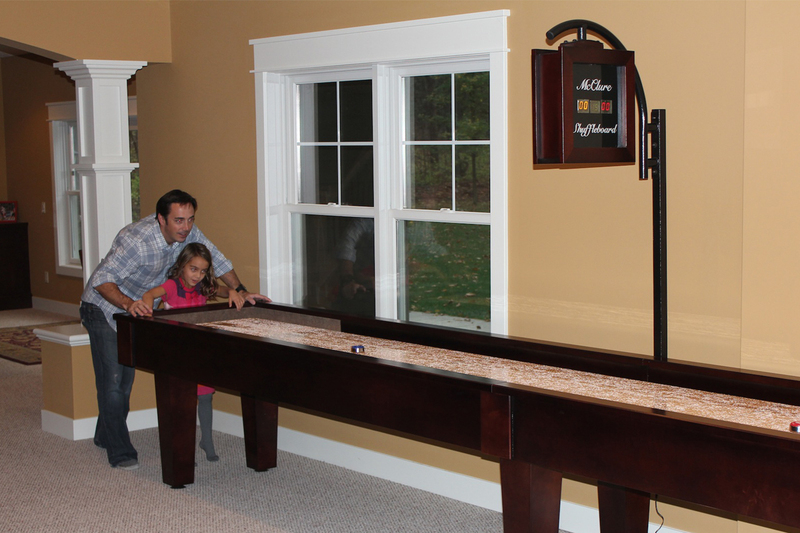 Review: We love our McClure Shuffleboard! It is a work of art with its superior quality and finish. Our nine foot table has given us plenty of hours of fun. It arrived on time and exceeded our expectations. 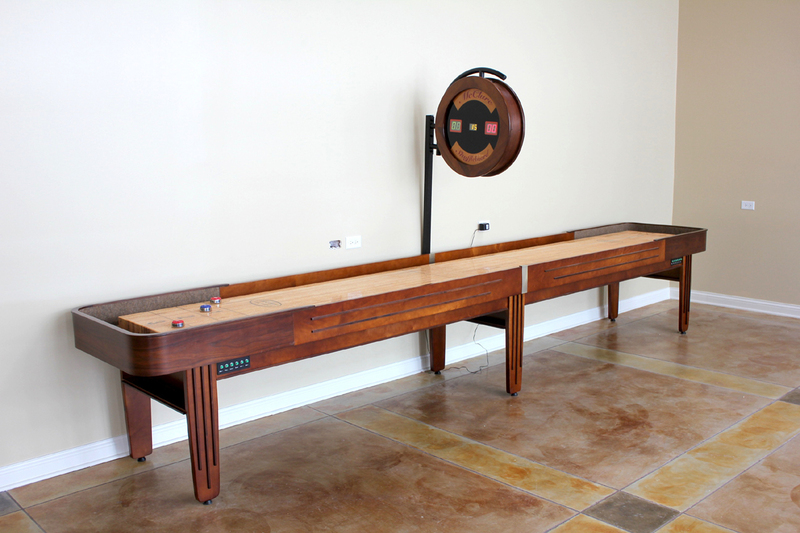 We fitted it in our family room, which instantly became the most popular sport in the house for family and friends. Even though it was pricey it was worth every penny. Thank you Todd! Review: Wow was the table a hit!!! was soooooooo surprised and happy with the table and he absolutely loves playing on it! He thinks it's better than all the rest of the tables he plays on at other homes! He's really happy with it and loves the logo's! The look on his face was priceless when he came in the door and saw the table through the railing to the basement...I had the room all lit up ,,,he went flying down the stairs and was almost in tears he was soooo happy.! Thanks for making my husband so happy and working with me on the logos' ,timing,,etc,,,it has been a real pleasure to deal with such a great company and you!!! You make a wonderful product with superior quality! And the picture's you sent of you and the crew are great in the "Man Cave Book". The surprise worked!!! He loves it!Thanks a million Todd, and tell your crew thanks too! They really made a fine table and your company is the best!!! Review: Love the table and family business. I wish it had a duel scoring system which included 1-4 for beginners and traditional 1-3 for better players. I also need a recommendation for a local technician that can straighten out the curves in the table that are especially evident when using faster wax. Please call or email me with recommendations. Photo to follow in a separate email from my phone. Thank you! 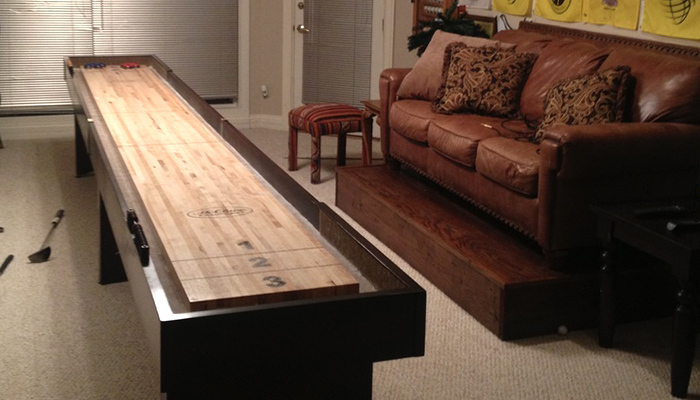 Review: I couldn't of asked for a higher quality affordable shuffleboard table! 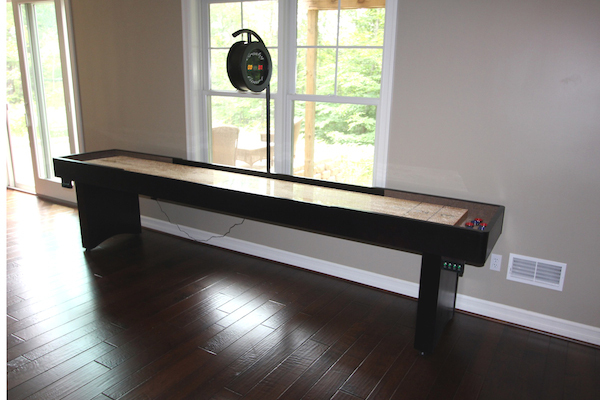 The Competitor II table gives my family and friends endless hours of entertainment and is a great show piece in my "Man Cave". Thanks again for making such a great product. 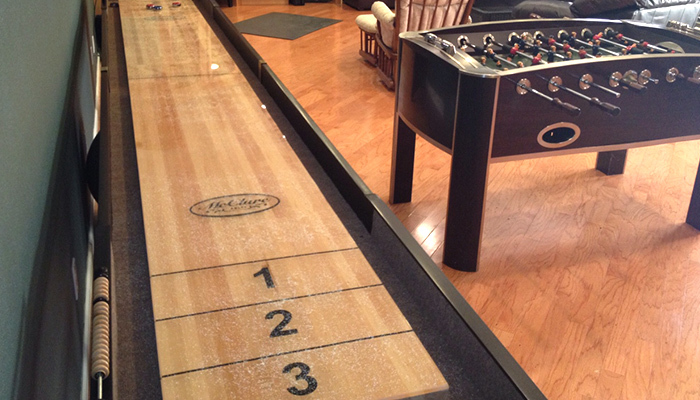 Review: I absolutely love my new McClure, 12ft Shuffleboard! 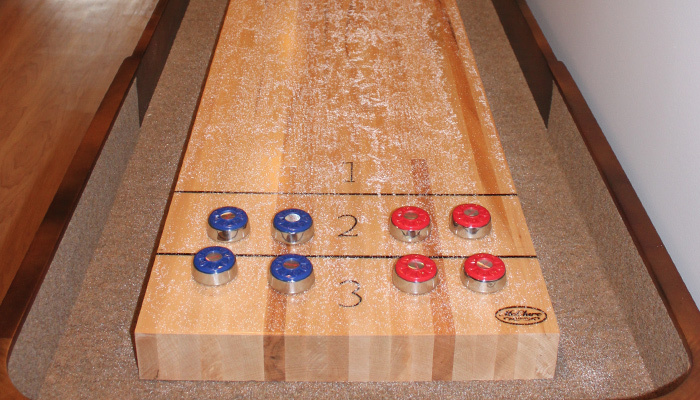 I have always wanted a shuffleboard for my home, so once my wife and I refinished our basement, I began my research on shuffleboards. The craftsmanship and beauty of this handmade table is unbeatable. Not to mention, I am a life long Pearl Jam fan, having seen the band 40+ times in concert, so the option and ability for Todd and McClure Tables to place the Pearl Jam logo on this board, making it a true one of a kind, is unbelievable! 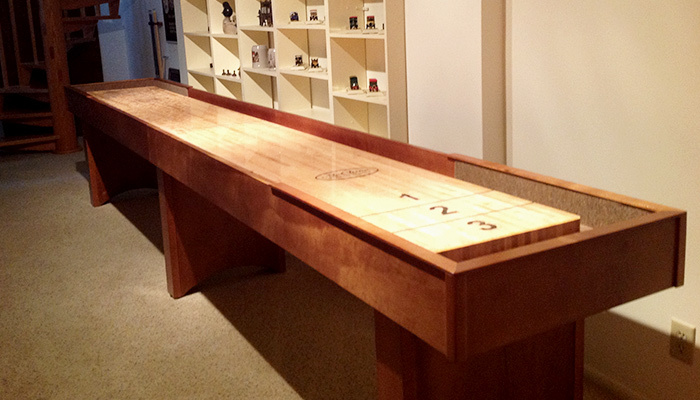 Review: We used McClure Tables for a custom shuffleboard in our new office. Todd and the rest of his team did a great job listening to our requirement and delivered an excellent end product. I could not be happier with the product and the service we received along the way. Thanks! 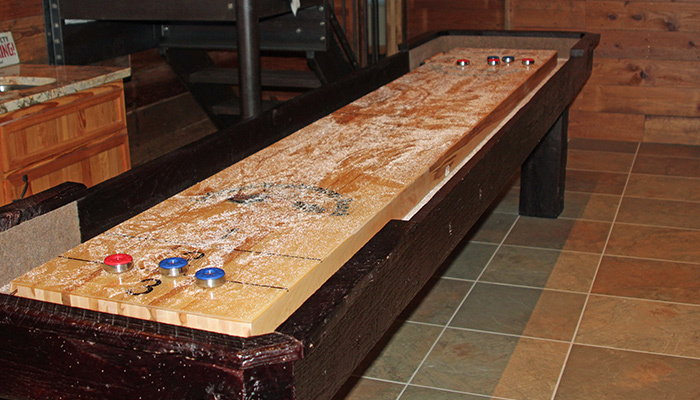 Review: The shuffleboard table is extremely accurate and of the highest quality. From my first conversation with the owner to a very well orchestrated and professional delivery, McClure's has far exceeded my expectations, It is a game that four generation of my family can play and enjoy, and we do so several times per week. 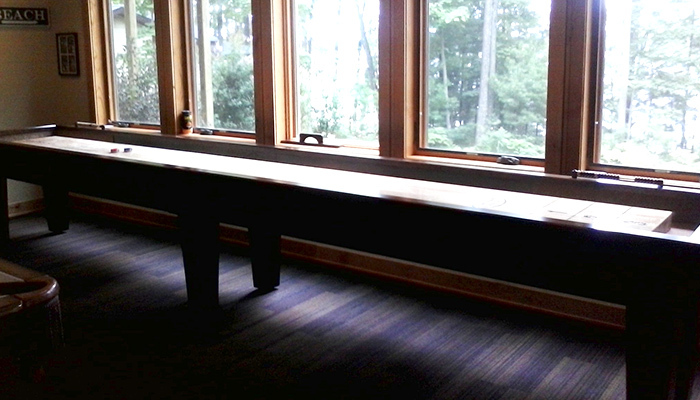 Review: We ordered a 16' Competitor II style shuffleboard table with the cinnamon finish through McClure Tables last August. It was sent right to our door within a few weeks. The table was in perfect condition, heavy and very well made. We decided to put it together ourselves, which wasn't too difficult after watching the instructional video on their website. The table gets used every week for family games and even more so on the weekends when we have friends over. The table is solid and will stand the test of time. 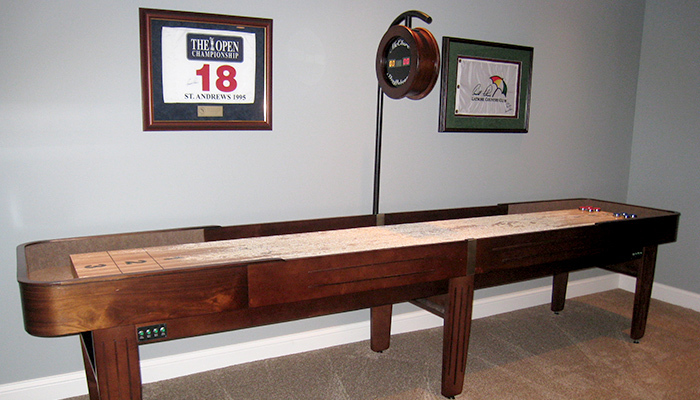 If you are looking for a beautiful, solid, well made shuffleboard table I would definitely recommend McClure's. Review: Found McClure by just banging around the internet. I needed a table under 12 feet to fit into my bar area. When it came, it had a slight ding in the wood and McClure's said they would pay for an onsite repair - no ifs, ands or buts. Table is beautiful and it seems to have increased the number of "friends" I have in my neighborhood. Great family operation and I would recommend them to anyone. 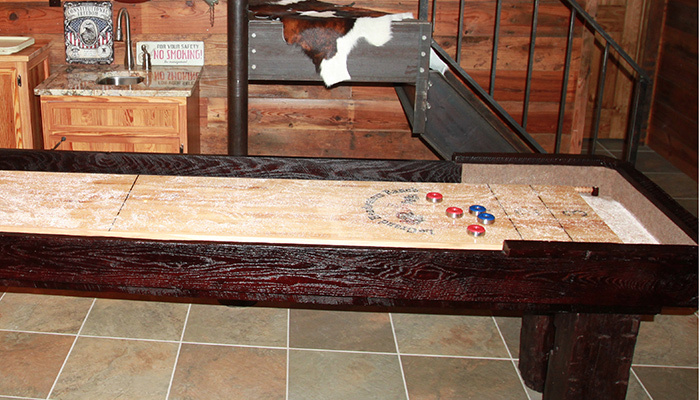 Review: We have been sooo pleased with our shuffleboard. The delivery company was fantastic and the board is great! Our friends and family are so impressed with the quality. We only wish we had room for a bigger one! 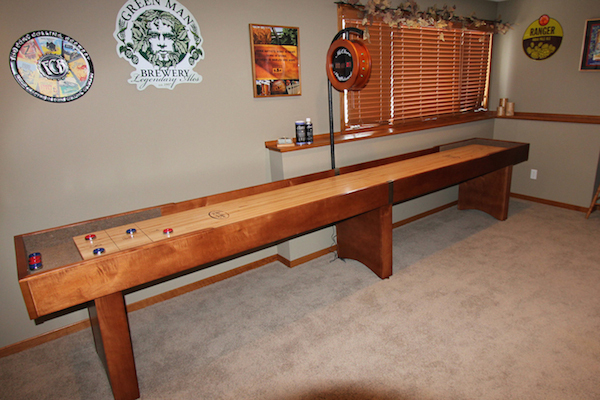 Review: Our table is the centerpiece of our game room. It's added a lot of enjoyment to our family, and our friends love to come over and play!! We used to have a pool table, that went largely unused...this is great! Thanks much, Todd and team! 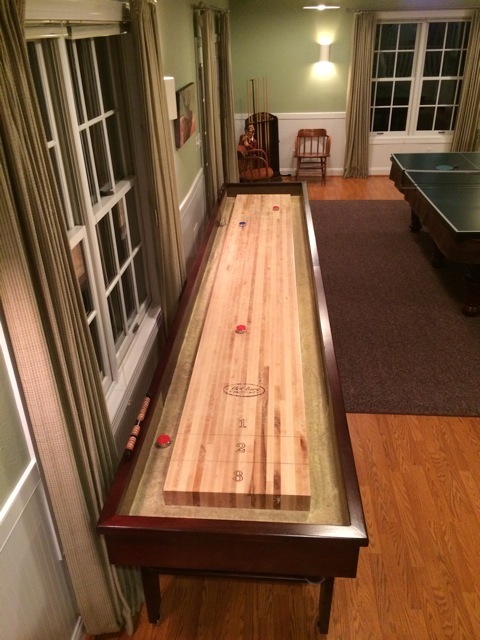 Review: I am thrilled with my Competitor II - part of my reason for getting a shuffleboard table was that I thought people with little skill would enjoy it more than pool or ping pong or foosball. Little did I know that it would become a favorite of my 18 month old daughter, who wants to play pretty much every night. There could have been no more perfect addition to our game room. Thanks Todd and the McClure team for a great product, a great value, and great memories. 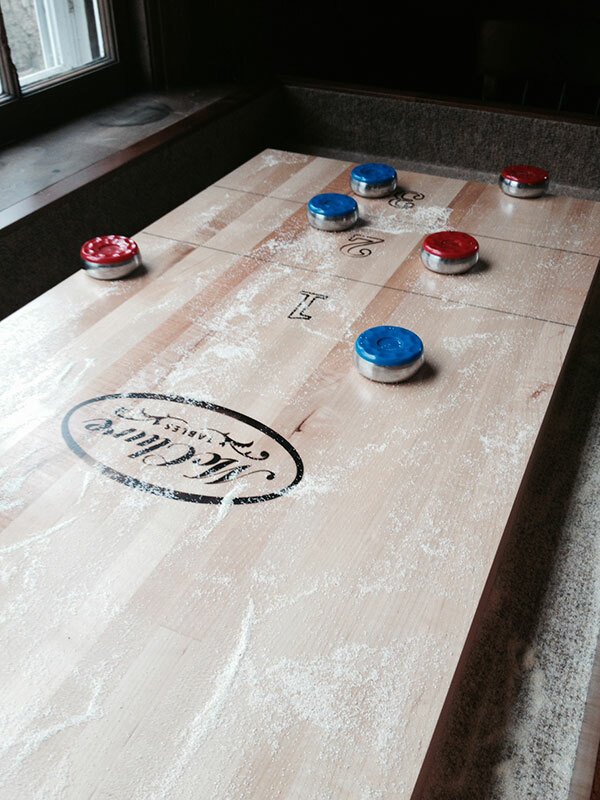 Review: My experience with Todd and the good folks at McClure shuffleboard has been fantastic. They spent a lot of time helping decide which table was right for my application. All questions were answered in a quick and courteous manner. The table set up fast and painless. One concern is that the brass joint covers don't fit very well; they are about 1/8" too short and don't rest flush across the top rail of the cabinet. Also, I was supposed to be notified 24 hours in advance of delivery but never was. Luckily, when the Fed Ex truck showed up unannounced I was able to get help unloading it. This I believe was the error of the shipping company. 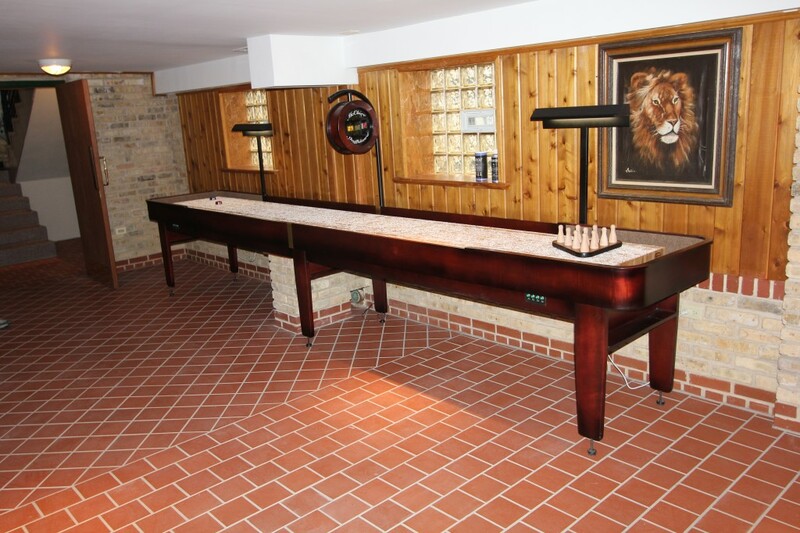 The table is a well crafted, beautiful looking addition to my basement. My family and I have spent great time together on our new McClure table! I recommend McClure Tables for their fine quality and great customer service. 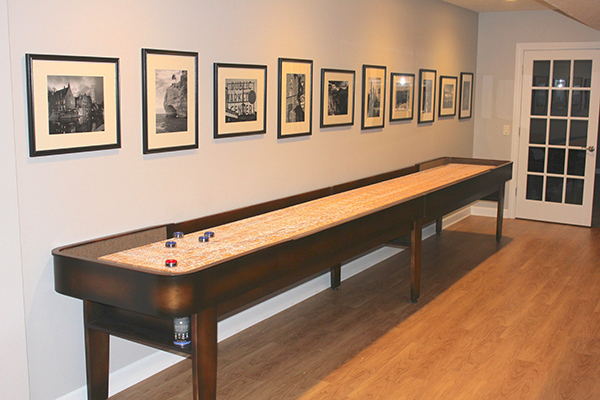 Review: Our McClure shuffleboard table is the centerpiece of our basement and the source of a ton of fun for our family and friends. Our 3 year old daughter can participate in games with her older brothers. It's a game for all ages. The table is beautiful and so pure. The McClure weights are top notch and sound great sliding along the table. It's the single best investment our family has made in the gaming world. 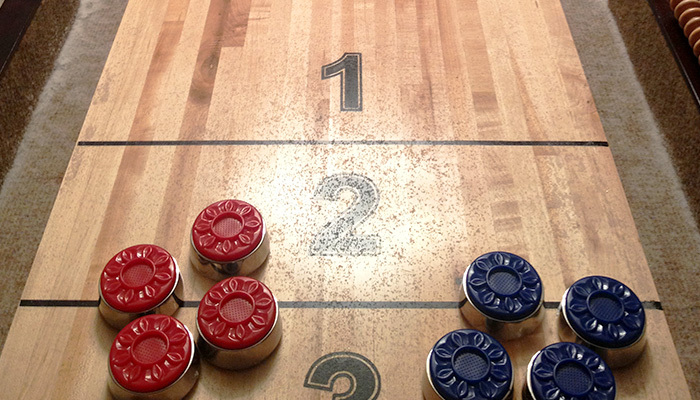 Review: I can finally I include in my life a love of growing up with shuffleboard. My McClure Competitor ll Board is a dream come true. It is everything I remember and it is simply wonderful. It is, along with everything else, a beautiful piece of craftsmanship, professionally made, professionally installed and it has provided hours of entertainment and fun for everyone of all ages. I should have gotten one years ago. Thank you McClure! 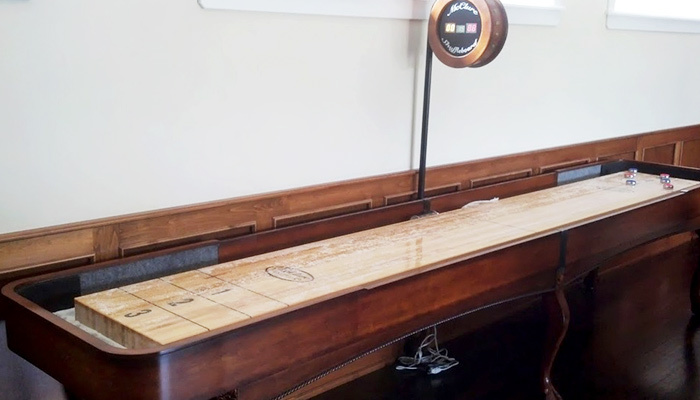 Review: After many months of doing my research and searching for a quality shuffleboard table at a reasonable cost, as anyone searching knows they can be very expensive, I stumbled across McClure Tables. (Thankfully I did). I knew right away that I was interested in the Competitor II table. It had the thickness of the playing field that was close enough to a regulation sized table, along with the width. I decided to call and speak to customer service because I still had hesitations and questions. Mr McClure answered the phone himself (which was shocking) and was very helpful answering all of my questions. I had just finished my bar in the basement and wanted to make sure they could match the stain. To my surprise they were able to do that at no extra cost, due to the fact they had the stain in stock. As soon as I hung up the phone I placed my order online, which was very easy to do. It was just short of three weeks before 4th of July and I was hoping to have the table delivered before then, for our big weekend party. After speaking to Mr McClure again he guaranteed me it would be delivered in time and sure enough it was. (A side note: all of their regular shipping comes with curb side delivery with a drop gate, which made unloading the table that much easier since it was 16' long and pretty heavy.) Upon opening the box I could tell this was a high quality table, made from solid maple wood. I followed the online video on how to set up the table which was very easy. Leveling can be a bit time consuming but it is worth it. Needless to say I am very happy with my decision to go with McClure tables, as were my guests. They could not stop talking about how great the table was. We have played almost every night since receiving the table and plan on playing many more nights. Thank you so much to Mr McClure, the McClure family and everyone else who works there for such a wonderful product. 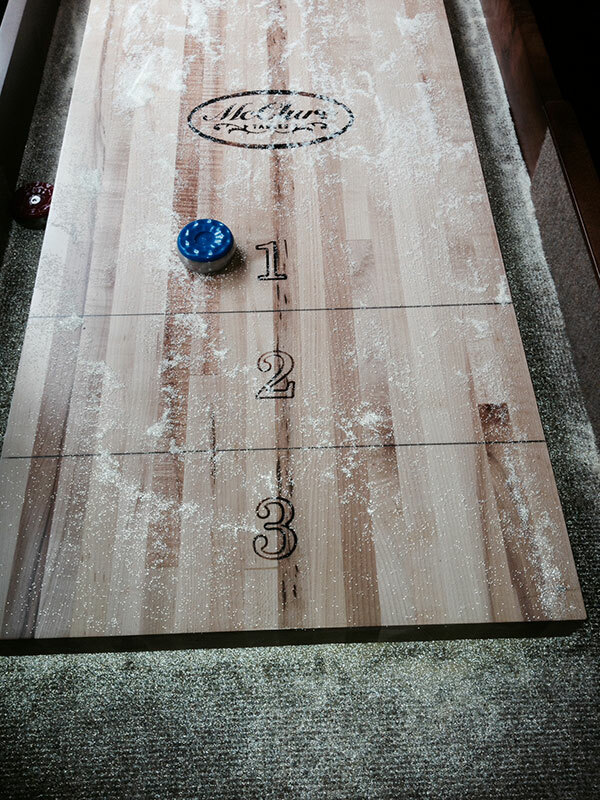 Review: Our Shuffle Board game is always a hit when we have parties and can create great excitement at times. Thank you for making such a fine table, people who see it are very impressed. 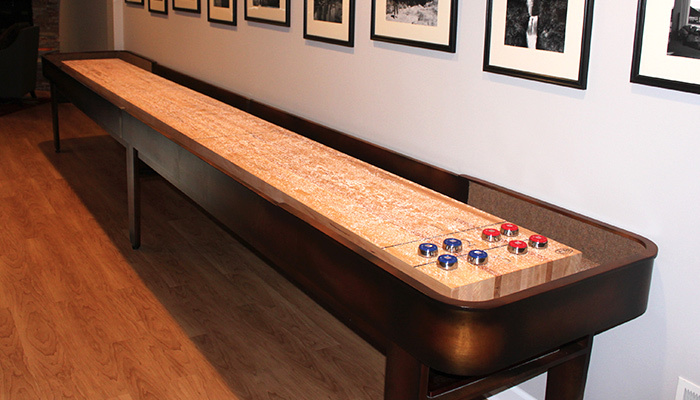 Review: After many months of researching shuffleboard tables, I chose to go with the Competitor II to finish off my basement bar. Todd McClure answered many emails and phone calls from me and helped steer to this table. 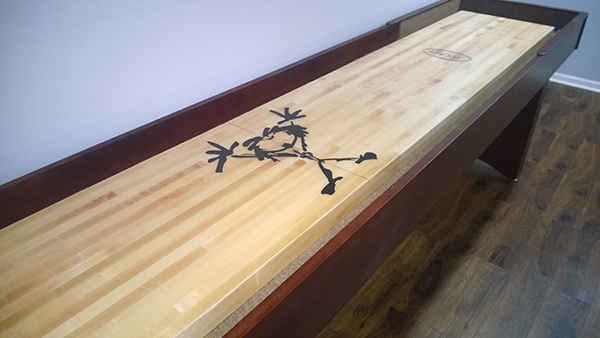 I had it done in a custom stain and had a custom logo put on the table. I received my table yesterday in Idaho. I was so excited to get home from work and get it set up. 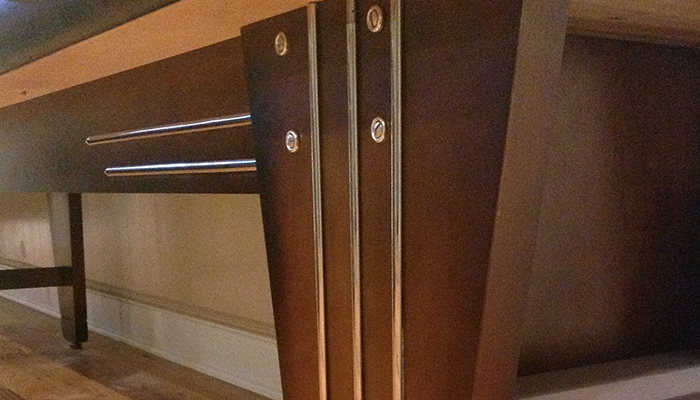 I inspected every inch of the table and the craftsmanship and quality exceeded my expectations! It was easy to set up with the help of a few friends. The table is absolutely gorgeous!!!! Im so happy I went with this "made in the USA" table! Thank you Todd and McClure tables for exceeding my expectations and delivering me such a quality product at an affordable price! Review: Todd, Just want to let you know we love the table. It is awesome and all our family had a blast playing during the super bowl!!!! So glad you told us about the delivery guys. We would NEVER in a million years have been able to carry it and assemble it!!!!! Thanks again. It was a pleasure talking to you. 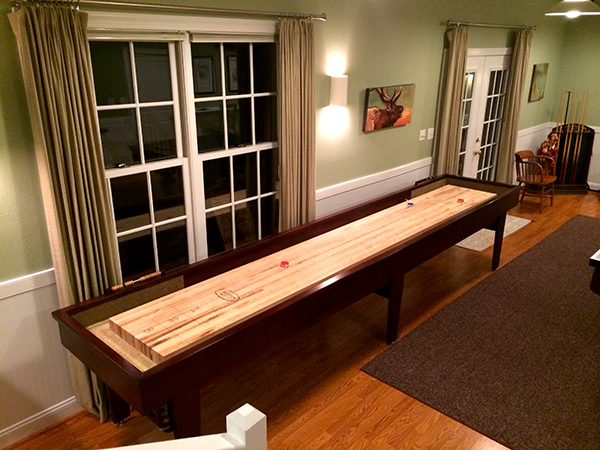 Review: Our 12-foot McClure table arrived today! 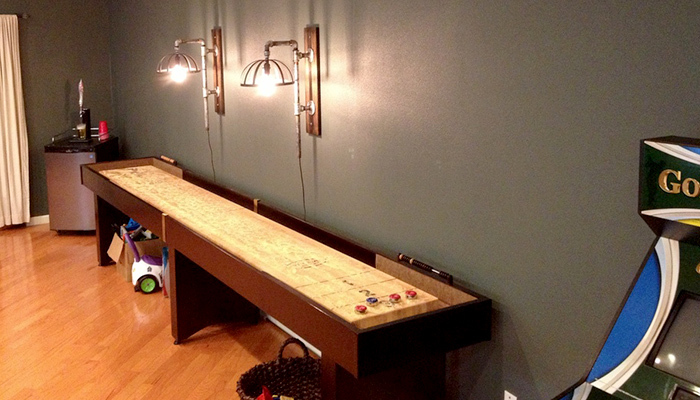 It's a real work of art, and I can hardly wait to introduce our young girls to shuffleboard. Thankfully, it fit perfectly through a basement window and the guys had no trouble setting it up. We're just waiting for the scoring beads, and then it will be all set. Review: From the first stages of table research, through the purchase process, and even the service AFTER the sale, McClure Tables is outstanding! The lead time was just right, and our table arrived exactly when expected. We had a few questions during setup, however it was in the evening (after normal office hours), so we tried calling the 800 number just to see what happened. Our call and our questions were answered, exceeding our expectations! 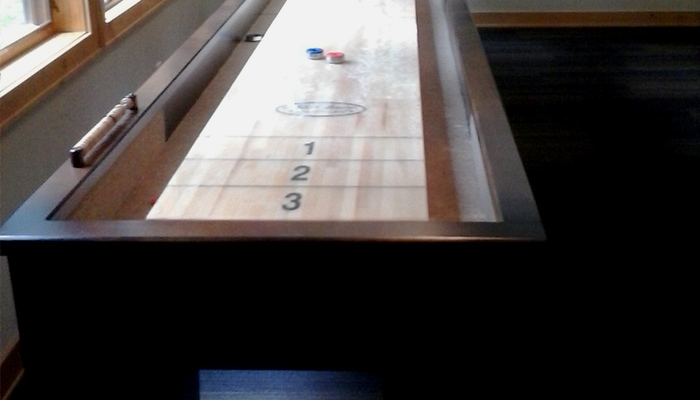 Within a few hours of delivery, we were completely setup and playing shuffleboard. All of our friends are in awe of this true work of art from McClure Tables, and we just couldn’t be happier! 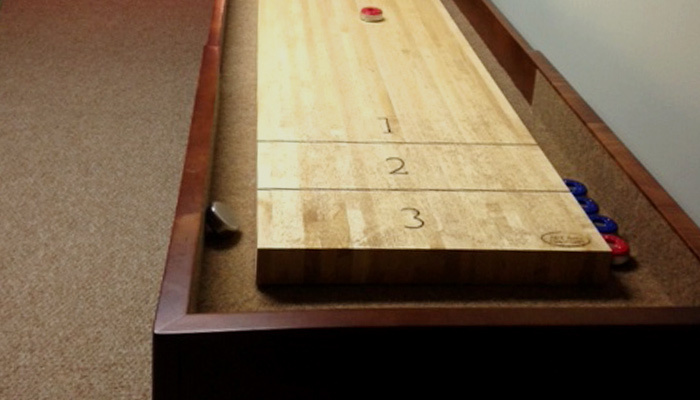 I highly recommend McClure to everyone considering a shuffleboard table.